Breggo is a new winery in the Anderson Valley. The word Breggo means ‘sheep’ in Boontling, the private language Anderson Valley locals used in the late 19th and early 20th centuries. Boontling uses the syntax of English, but replaces parts for wholes and refers to things by their uses. For example, Boonville was referred to as “Boont,” people living around Boonville were “Boonters,” Philo was “Pleeko,” good food was “bahl gorms,” and “seeps’n’chiggle,” was good wine. The Breggo estate is a 203-acre farm located just north of Boonville. It was a former sheep ranch and the sheep, like Pinot Noir vines, found the inhospitable cool climate to their liking. The co-proprietors and husband and wife are originally city folk. Douglas Ian Stewart is a native of Sonoma who found early success producing Brazilian sorbet. Ana Lucia Benitez-Stewart hails from Ecuador where her family had a dairy farm that she visited in the summertime from her home in Quito, but she had little interest in farming as a career. She found an exciting string of jobs that included being a park ranger at the Galapagos Islands and tour guide in the Amazon. Douglas proposed on a hillside in the Anderson Valley and now they too have come back full circle to a setting in the countryside of Mendocino County. "Breggo" is boontling for sheep. The property is located on Highway 128 and was a former sheep ranch. A winery has been built and wines are being produced from purchased grapes. An estate vineyard is planned for 2008. Pinot Noir is sourced from three well-known Anderson Valley vineyards: Ferrington, Savoy, and Donnelly Creek. The consulting winemaker is Ryan Hodgins, a U.C. Davis trained vintner who also makes wines at Hanzell Vineyards in Sonoma. 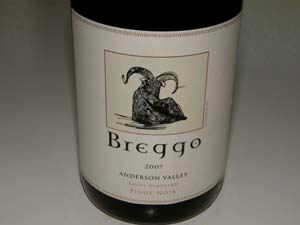 Update: Breggo was sold in 2011 to Cliff Lede who also acquired Savoy Vineyard.